Visit the world’s only dedicated Jack the Ripper museum, learn about the suspects and victims of the terrible murders and step back to the year 1888 - the year that Jack the Ripper terrorised the streets of Victorian London. Set across six incredible floors, the museum shows painstakingly recreated scenes connected to the murders alongside artefacts that have never before been shown to the public. See a realistic recreation of PC Watkins discovering the body of Catherine Eddowes on Mitre Square and visit Jack the Ripper’s ‘sitting room’, containing medical instruments, books and an impressive and fascinating collection of Ripper memorabilia. Visit a recreation of the Whitechapel police station that was the epicentre of the investigation and inspect a wall of clues, including original newspapers, police artefacts and the ‘From Hell’ and ‘Dear Boss’ letters. 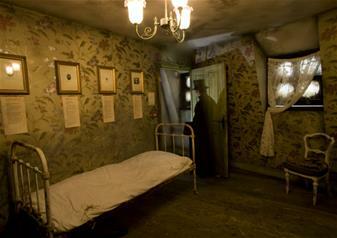 The attic of the museum is a recreation of victim Mary Kelly’s humble living quarters, the room where she lived and died. Here you will learn the life stories of the women he murdered – a poignant exploration of the domestic and working lives of the Ripper’s victims. If you dare, descend to the morgue, where you can inspect actual autopsy photographs and read the medical reports of the nine women that fell victim to the Ripper’s knife. With all this evidence, perhaps you will be able to solve one of the most famous crime mysteries of all time! Jack the Ripper Museum, 12 Cable Street, London E1 8JG.